Stockholm: So on trend its almost Scandi’lous! 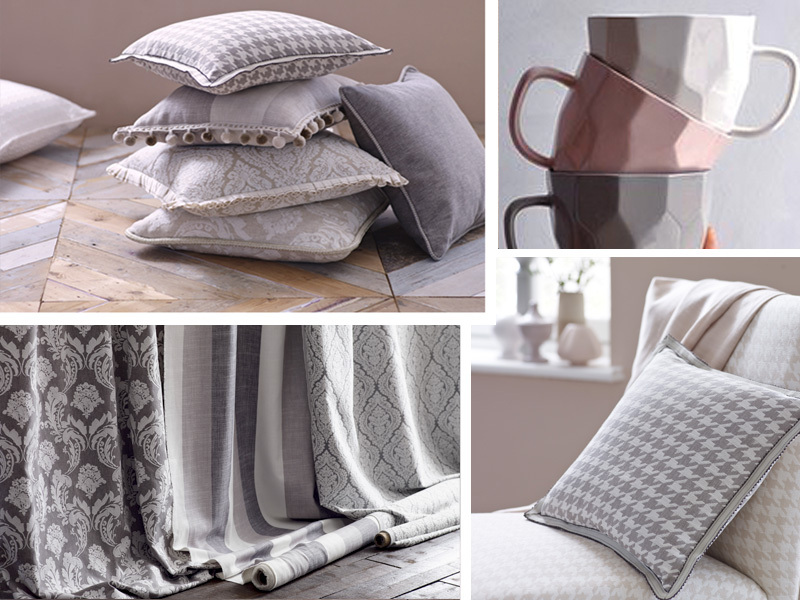 Vogue has stated white, beiges, pale greys, camel and blush pink are must have tones for 2017 and if you look at Stockholm, we have that in abundance. 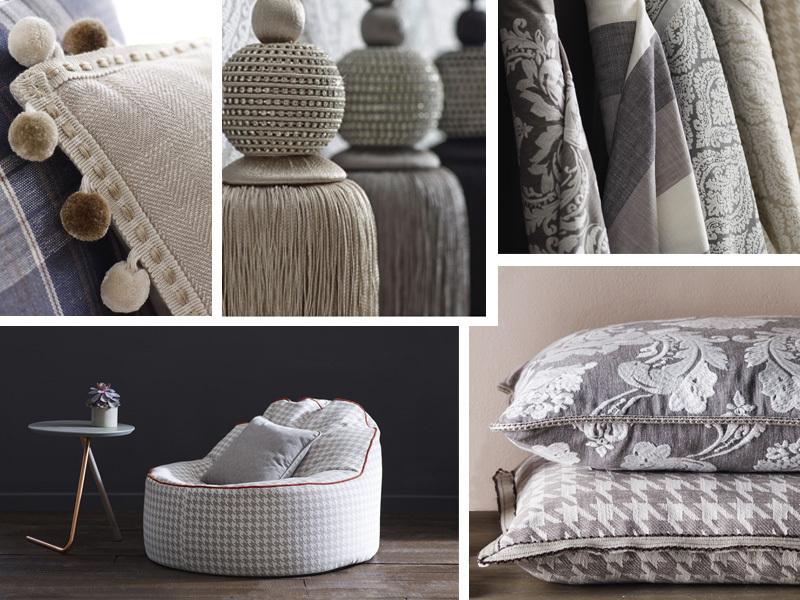 Greys, (combined with white) are what’s popular, creating a calm and tranquil palette. However, varied shades of grey all the way up to a deep charcoal offer a canvas that welcomes a wide spectrum of colours. This makes it easy to add different shots of colour throughout the seasons, changing the look of a room with minimal effort, freeing up time and allowing you to appreciate more important things in life. After all, that’s what simple Scandi living is all about. 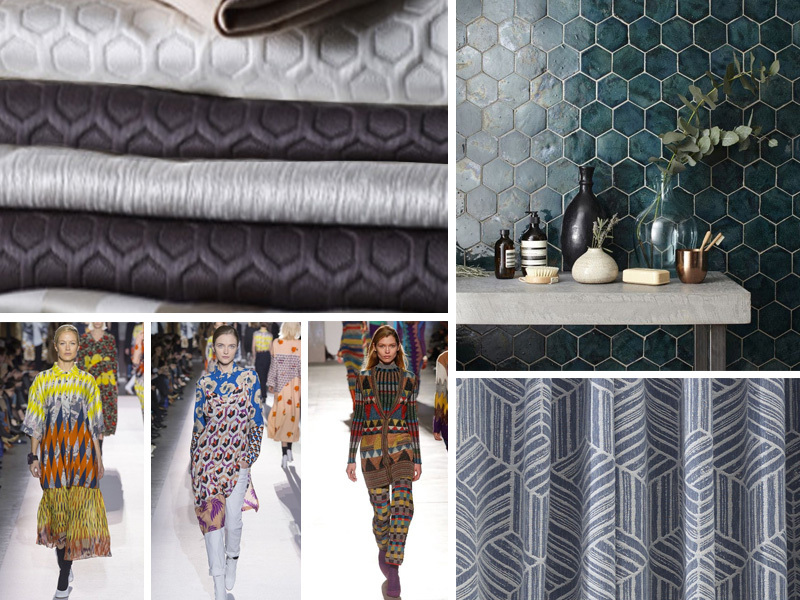 Texture has featured heavily in many catwalk collections recently and is so important when designing a room. Scandinavian design relies heavily on texture to create warmth and interest to what is usually a minimal colour scheme. This is done using natural products such as wood or metal furniture and accessories but can also be achieved easily with soft furnishings. Stockholm offers a wide range of texture, from embroidered leaf designs to woven and silky stripes, traditional dogtooth and even a check too. All these fabric designs can be elevated in texture by mixing them up together as scatter cushions or further sill by adding a fun or elegant trimming. Also, you could try adding drama by experimenting with dark walls, they are also in right now and a bit of Nordic Noir is the perfect backdrop to really make your fabrics pop. We’ve hexa-gon crazy for geos recently and the catwalks have been filled with exciting ethnic geos prints for Winter 2017. Bathrooms and Kitchens are also seeing our six sided friends (the hexagons) favourably plastered over floors and walls, adding an interest and quirkiness that you just can’t get from a square! Stockholm’s Lund fabric is a honeycomb inspired geo pattern, woven using a silky yarn that has reflective qualities, adding subtle interest and working in harmony alongside simple Scandinavian neutrals. Stockholm’s Salsta fabric also rides on the geo train with its bold design of cubes. A striking pattern that works surprisingly well on curtains and on the catwalk as featured recently in Gucci’s latest collection. Similar to the greys we visited earlier but with added pizazz. Metallic, especially silver is set to take over for 2017/18 with fashion designers featuring collections that reflect this on recent catwalks. Stockholm’s Visby fabric encapsulates this fluid style, weaving metallic yarns to create a liquid silver effect that sits perfectly with this latest trend. 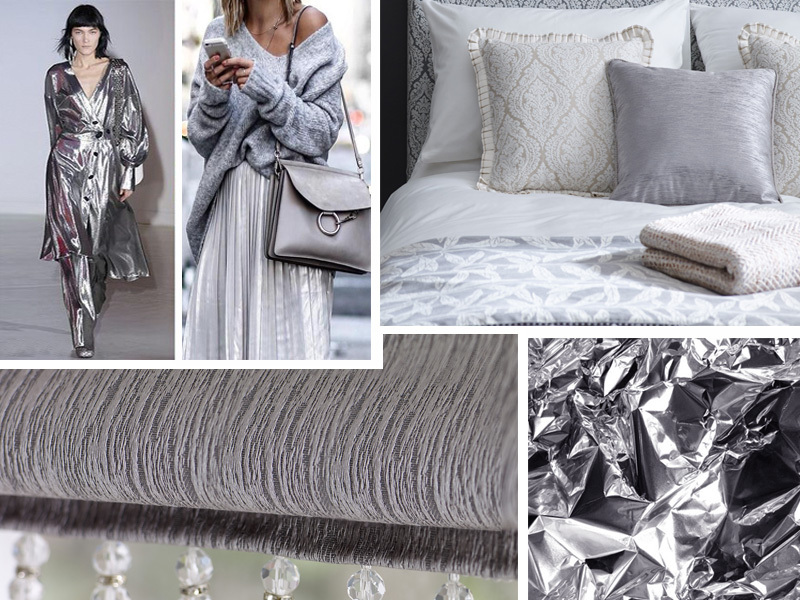 These metallic tones never really fade, always becoming popular towards the end of each year. As the dark nights of the Winter months close in everything becomes a bit more twinkly, getting us in the mood for a special time of year….. Christmas, which wouldn’t be the same without a bit of sparkle and of course a sequin party dress. 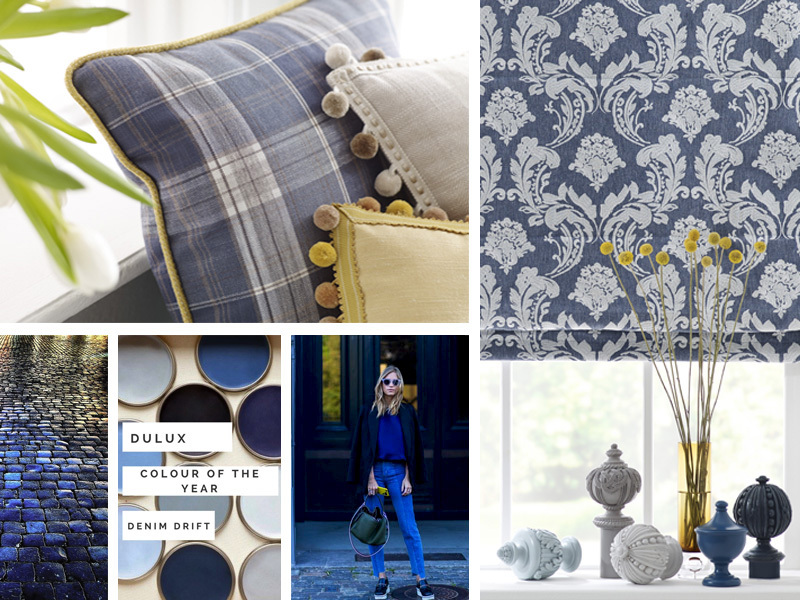 Dulux predicted Denim Drift as colour of the year for 2017…. they were not wrong! This fantastic blue shade is everywhere so it’s no surprise that we have included it in Stockholm too. Denim blue adds fun to the Stockholm collection, especially when paired with bright ochre accents. It also works alongside muted greys beautifully if you prefer a demure Danish feel. Whatever you decide to do with blue, the choice is totally yours… choice being something you have plenty of with Stockholm. 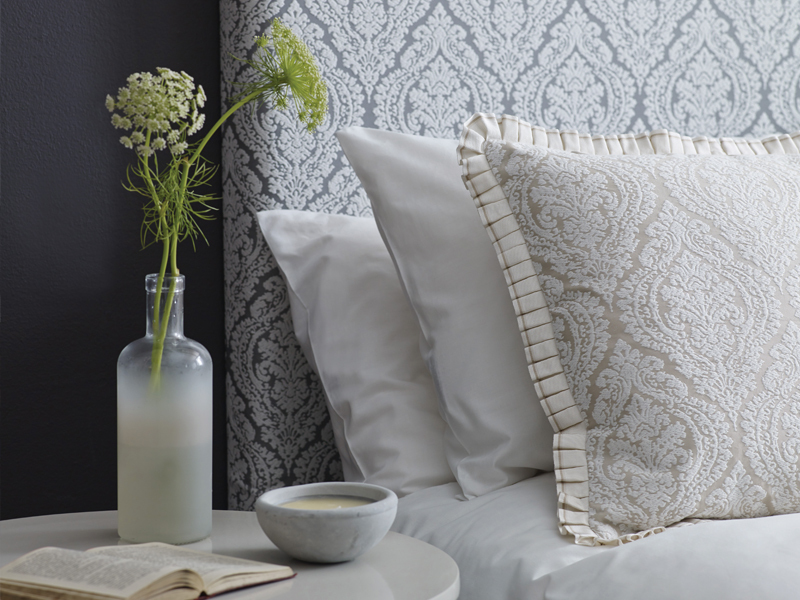 We hope the Stockholm Fabric Collection has left you feeling a little more inspired than you were at beginning of this blog. However, if this has only whet your appetite and you want to carry on feeding that creative mind of yours then head over to our Pinterest page and check out our boards on trends, products and more.